The Goldendoodle is a cross between a Golden Retriever and a Poodle, a cross that originated in North America in the late 1990’s. Poodle crossbreeds are meant to produce a dog with mixed traits and the Poodle’s signature nonshedding coat. Like all Poodle crosses, the Goldendoodle goes by many names, including the ‘Goldipoo’, ‘Goldenpoo’, ‘Groodle’, ‘Curly Golden’, ‘Goldenoodle’, ‘Goldoodle’, or the somewhat less appealing ‘Gopoo’. Like other ‘designer breeds’, the Goldendoodle has seen a recent surge in popularity. As a crossbreed, the Goldendoodle is not eligible for registration with purebred registries such as the American Kennel Club, but it can be registered with the American Canine Hybrid Club. The Goldendoodle is not considered a purebred because it doesn’t ‘breed true’, meaning that it doesn’t display a consistent set of characteristics. Some breeders produce Goldendoodles by crossing a purebred Poodle with a purebred Golden Retriever (called a first generation cross), but others allow crossing Goldendoodles with Poodles or Golden Retrievers (called a backcross), or other Goldendoodles (called a multi-generation cross). Different crosses can result in different characteristics. The Goldendoodle has an average shoulder height of 20-29 in (51-74 cm) and weighs 45-90 lbs (20-40 kg); mixes with Miniature Poodles or Toy Poodles tend to be smaller. As a crossbreed, the Goldendoodle has a wide variety of appearances. Those with more Poodle influence tend to have a thinner coat and shorter muzzle, whereas the Golden Retriever influence results in a wider neck, and longer muzzle. Goldendoodles can have short or long ears; most have a ‘V’-shaped ridge from the forehead to the nose. The Goldendoodle’s coat is a cross between the Golden Retriever and Poodle coat. It has fine hairs which appear quite thick. It can be curly or straight, most fall somewhere in the middle. Unclipped, the hair will grow about 4-7 in in length. Unlike the Poodle, the Goldendoodle should not be clipped any shorter than 2 in, as the coat provides natural protection in heat and cold. Depending on the Poodle influence, the Goldendoodle can come in a wide variety of colors including white, tan, chocolate, black, red, silver, or a mix thereof. A variety of colors and coat textures can appear in the same litter. Depending on the source breeds, the Goldendoodle may shed little to none like the Poodle or shed moderately like the Golden Retriever. Generally, the lower generations are better for allergy sufferers. Most Poodle crosses will go through various coat phases in their first year of life. The Goldendoodle is intelligent, friendly, and family oriented. It is a highly social dog. Goldendoodles tend to follow their nose wherever it leads, so a fenced-in yard is recommended. They are always ready for a game; most Goldendoodles retain the natural retrieving instincts of the Golden Retriever. The Goldendoodle’s friendliness with strangers makes it a poor watchdog. Goldendoodles do not bark frequently. The Goldendoodle is intelligent, friendly, and family oriented. It is a highly social dog. Goldendoodles tend to follow their nose wherever it leads, so a fenced-in yard is recommended. They are always ready for a game; most Goldendoodles retain the natural retrieving instincts of the Golden Retriever. The Goldendoodle’s friendliness with strangers makes it a poor watchdog. Goldendoodles do not bark frequently. Goldendoodles love to be with their family. They are eager to please and get along well with children, other animals, and strangers. They are social dogs and crave being around people. You can find Goldendoodle puppies priced from $250 USD to $95000 USD with one of our credible breeders. Browse through our breeder's listings and find your perfect puppy at the perfect price. Goldendoodles love to be with their family. They are eager to please and get along well with children, other animals, and strangers. They are social dogs and crave being around people. The Goldendoodle requires regular brushing or combing every few weeks. Goldendoodles have a lifespan of 9-15 years. They are prone to most health issues affecting Golden Retrievers and Poodles, including hip dysplasia (malformed hip joint which can cause lameness or arthritis), ear infections (particularly for longer-eared dogs) and eye problems such as cataracts, but as a mixed breed they are somewhat less likely to suffer health problems than purebreds (known as ‘hybrid vigor’). The Goldendoodle is intelligent and has a strong desire to please its master, making it highly trainable. Positive reinforcement is likely to be the most successful approach. The Goldendoodle requires a moderate amount of exercise. Most enjoy swimming as both the Poodle and Golden Retriever are not averse to water. Goldendoodles can live happily on a farm or in a big city. They will thrive with daily walks or play time. Goldendoodle Puppies for Sale - Shipped Worldwide! Finding the right Goldendoodle puppy can be dog gone hard work. PuppyFind® provides a convenient and efficient means of selecting and purchasing the perfect Goldendoodle puppy (or Goldendoodle puppies) from the comfort of your home, 24 hours a day, 7 days a week. Take advantage of our PuppySearch or leisurely browse our directory of hundreds of dog breeds, Goldendoodle dog breeders, Goldendoodle dogs for adoption, and Goldendoodle puppy for sale listings with photos and detailed descriptions. Some Goldendoodle puppies for sale may be shipped Worldwide and include crate and veterinarian checkup. 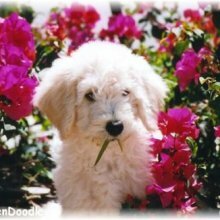 Many Goldendoodle dog breeders with puppies for sale also offer a health guarantee. With thousands of Goldendoodle puppies for sale and hundreds of Goldendoodle dog breeders, you're sure to find the perfect Goldendoodle puppy.